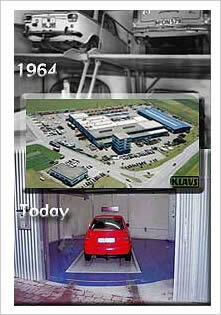 The first Klaus car parking systems entered the market in 1964. In 1972, the production is extended to three different series. By 1973, the company has become one of the leading manufacturers of car parking systems world-wide, and moves into new premises in Aitrach (near Memmingen, southern Germany), In 1975, the first licences are granted for the production of car parking systems. By 1980, Klaus is internationally renowned for innovation and technical progress in all its business lines. In 1985, the company again expanded its product line.